Am 21. September 2001 um 18:00 h materialisierte Alien City im Brahmsfoyer der musikhalle hamburg beim hamburger musikfest mit der Performance "Dialog zweier Passanten in der Menge", �bergehend in eine Installation, die um 24:00 h endete. Die Performance wurde in einem Webcast live �bertragen, der hier dokumentiert ist. On Sept. 21st, 2001, 18:00 (CEST) Alien City materialised in the Brahmsfoyer of the musikhalle hamburg on the occasion of the hamburger musikfest. 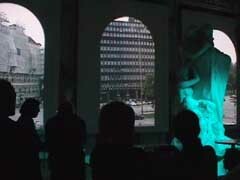 The performance "Dialogue of Two Passersby Meeting in the Crowd" was followed by an installation which ended at 24:00. The performance was webcasted live. This is the documentation of the webcast.